I made account in these side, i get 7€ no neposit. I played and win almoust 400€. Then i was talking in the chat about deposit and withdraw, everyone wash very nice and i get good support help. I asked would be a problem to the withdraw because i had my driverlicence my old last name ( surname ) but i have official document for my name change. They answer that if i got the document that should be a problem. Then i make a deposit played needed wagering and make withdraw 200€. I send all the document´s 3 times before i getting answer that my account was closed and my money has been transfer away from me. Every else my card i had my last name right. So they took my money, even the deposit. Don´t ever deposit anything in this side!!!! Which site are you having problems with? Just in time for February! They have tripled the prize of the Nightly Coverall! Be there every night at 10:00 PM for the Guaranteed $750 Coverall. This coverall is programmed to start at 50 calls and add one number every two nights until there is a winner. Minimum jackpot $100 CASH! Preorders now available! Join them tonight for a chance to win $750 in 53 calls! Make the House your Home! Call house the most each week overall in ANY 90 ball room & win a £25 bingo funds! Blink & you’ll miss it… bingo the most on the Big Brother pattern during the week & win 10,000 jps! Play on BigBrotherBingo during the week and if you win the most on bingo or instants you’ll win £15 each – but if you lose the most on bingo or instants you’ll win £20 each! It's Fiesta Time! These fantastic games play every day from 1pm - 4pm ET in the Valentine Bingo Room offering 3 chances to win for only 25c a card. The new Rollercoaster Bingo games will keep you on the edge of your seats as the prize climbs all the way up to an incredible $500 before dropping all the way down to $50. Like all the best rollercoasters, the prize then climbs again back up to $500. Rollercoaster Bingo will play in the Valentine Bingo Room on Wednesday February 19th. The fun starts at 6pm ET as we bring you 2 hours filled with these incredible Bingo games. Play at Clucky during February and you could win a whole month of free bingo worth over £300. Win a delicious share of £10,000! And once an hour there will be a low price bingo game; ‘Cheap as Chips'. Look out for this just after the big prize games meaning you can play for longer! Make your initial deposit this week to receive a 300% Welcome Bonus plus 6 free cards for the final Oscars Countdown game which plays this Sunday! You can win a huge 51-inch Samsung 3D Plasma TV worth over £450 and turn your front room into a cinema! Win the most chat games in the Tuesday Nuthouse each week and get a £5 Love2Shop voucher! 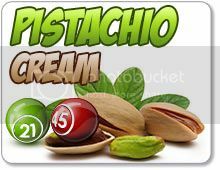 Celebrate National Pistachio Day in the Quarter room, Wednesday, February 26th starting 8 PM EST for an hour of coverall games with prizes up to $1000 per game! It can't get any tastier! Play Qualifying Slot games with Bonus! In March from Sunday to Wednesday play any qualifying slot games with BONUS money as well as cash and winnings!! Have a go during special days when all your funds can be used to spin any of the qualified reels! Qualifying slots: Get Cracking, Hollywood Reels, Three Times the Riches, Rainforest Riches, 7s Blaze, Double Diamond, Black and White, Fire and Ice, Lucky 7, Wild Cherry. Enjoy 10 days of great prizes! Mark the dates in your calendar and get ready to join them for 10 days of prizes, exciting offers and non-stop joy! 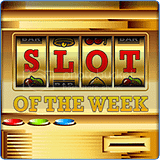 Every week a different slot will bring you fantastic extras! Prize: Get an extra 10% cashback all week! Happy St. Patricks' Day LBB'ers! Spring has arrived! Enjoy this week's spring bingo promos! This month's Special patterns playing are April Fool, Large Egg, Rabbit Ears, Small Egg and Easter Egg in the Red (Nickels) room with guaranteed 25 USD. Bingo on all 5 of them to win extra 15 BBs. Claim the Welcome Bonus this week and grab an Extra £10 Free to play New York! Join them for New York 90 Ball Bingo and discover a stylish chat room, exciting chat games and the chance to win hot cash prizes from only 10p! Every night is party night here at The Bingo Party but on Fridays we go all out! From 8pm to 10pm every Friday they give away LOADS of Loyalty Points and host special party chat games! Easter is this month and the online bingo sites are running loads of promotions. Take part in special prize games or earn free tickets for jackpots games at the end of the month! There's $19,500 in FREE CASH PRIZES this Spring ! All depositors with at least $50 in total deposits in the last 7 days will get free cards for the event! Feeling lucky? Pick 3 numbers between 1 and 18, purchase a card in bingo and if your 3 numbers are called, be the first to type “LOTTO” you WIN! In April for every £20 you deposit and for every £20 you wager you will be awarded one bingo ticket. Use these to play a game each month for your chance to win the monthly first place prize of £1,000, second place of £300 and third place of £200! You could also win tickets in addition to tickets earned. Play Qualifying Slot games with Bonus Money! In April from Sunday to Wednesday play any qualifying slot games with BONUS money as well as cash and winnings!! During these special days all your funds can be used to spin any of the qualified reels! The Nightly Coverall has doubled its prize! 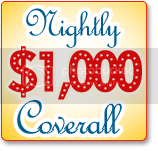 Join them every night at 11:00 PM for your chance to win our 11:00 PM Guaranteed $1,000 Coverall. 23rd April: Join them for some free bingo - yep that’s right! Play between 9am and 9pm and don't spend a single penny! Float over to bingo Lite Monday night for your chance to win a share of a not so lite £10,000! With 2p tickets and £250 Full House prizes this isn’t one to miss! Join in the fun from 7pm – 10.30pm every night until Friday. If you're out and about don’t miss out, play bingo Lite on the go on the app. Play the Massive Merlin Giveaway game on Wednesday 30th April at 10pm and one lucky roomie will win a Premium Merlin Annual Pass and spending money worth £1,000! Two adults and up to four kids will receive a whole year’s access to any of the UK’s 31 top sites, including Lego Land, the London Eye and Alton Towers! Did you know that April is known around the world as humor month? 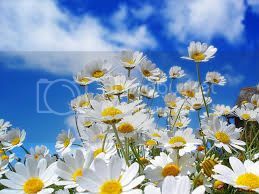 It's not hard to see that people become merrier once the flowers bloom and weather warms up. In between the jokes don't forget to join the Dollar Room Monday, April 28th. They will start at 7 PM EST with a full hour of games that have fixed prizes of $500. So get ready for an hour of madness, filled with total prizes of $5000 . May 6th honors the patient, early life-guiders who helped us all launch off into the real life: teachers! Celebrate by participating in the special promo that takes place in the Dollar Room on Wednesday, May 7th, between 9 AM EST and 10 AM EST. They'll have fun games with fixed prizes of $400 in store and one whole hour with total prizes of $4,000. Play BARGAIN BINGO twice a day in the Bingo Café between 7am & 8am and again between 7pm & 8pm. They also have 10 hours of Bargain Bingo on 7th May. Guess the artist and win cash prizes! Swing back to the ‘60s with the Funky Jukebox! Guess the artist behind a different classic from the rockin’ decade every day for your chance to scoop a cash prize! Wakey wakey! They’ve got something happening in the morning that’s worth putting your alarm clock on for. Every half hour from 7am – 9.30am you could win guaranteed prizes of £500! Join in the fun on bingo 90 on desktop, mobile or app. Hold on tight as Triple Whammy is coming your way and it’s bringing guaranteed prizes of £800 with it! Join in the fun from Wed - Fri at 8pm, 9pm and 10pm for your chance to win! Play on desktop or app. Make sure you fully enjoy every spring day, but also plan an outing on May 12 to celebrate Kite Day. Just hope for good weather and make a day out of it! The sky is the limit when it comes to the fun you can have. The weather does not count in the Quarter Room, from Monday, May 12th to Tuesday, May 13th, between 9:00 PM and 10:00 PM, as they are waiting for you with a celebration. They will be featuring special games with prizes of $150 on the first 50 calls, so do not delay!